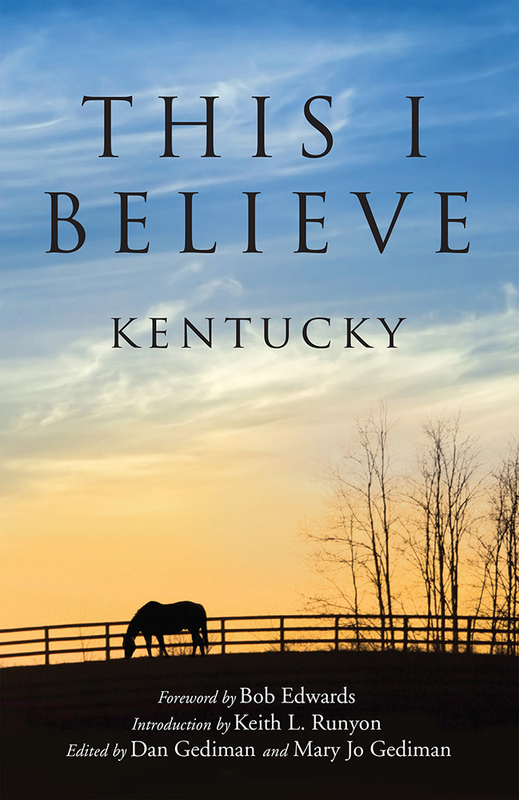 This collection of This I Believe essays gathers 60 thoughtful explorations of the core values and guiding principles of authors who are either from Kentucky or who are writing about Kentucky. The contributors range from former heavyweight champion Muhammad Ali, to Spalding University President Tori Murden McClure, to Kentucky Poet Laureate Frank X Walker, to best-selling authors Silas House and Sena Jeter Naslund, to ordinary Kentuckians from every corner of the Commonwealth and all walks of life. The book also features a dozen essays from Edward R. Murrow's original 1950s This I Believe radio series, including those from newspaper publisher Barry Bingham, Sr., journalist and NAACP executive Harry McAlpin, and U of L professors Charles Parrish and Edmund Schlesinger. 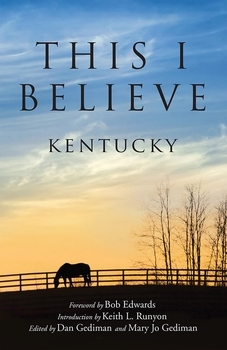 With a foreword from public radio host and Kentuckian Bob Edwards and an introduction from former Courier-Journal Opinion Pages and Book Editor Keith Runyon, this book is filled with inspiring and thought-provoking essays that compel us to rethink not only how we have arrived at our own beliefs, but also the extent to which we share them with others. Dan Gediman is executive director of This I Believe, Inc., a non-profit organization that engages people in writing and sharing essays describing the core values that guide their daily lives. These short statements of belief have been featured on public radio nationally since 2005. Gediman is co-editor of the New York Times bestseller This I Believe as well as six other This I Believe essay anthologies. Mary Jo Gediman is editorial director of This I Believe, Inc., and is co-editor of the books This I Believe: On Love, This I Believe: On Motherhood, This I Believe: On Fatherhood, and This I Believe: Life Lessons.